In my solution which is an ASP.NET Core project with React, Redux, and Kendo React Components I need to return my props as an array. I'm using the Kendo Dropdown widget as below. 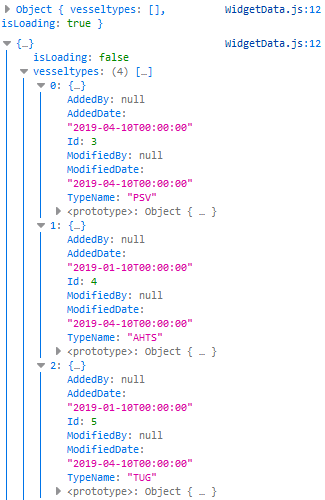 Failed prop type: Invalid prop data of type object supplied to DropDownList, expected array. So, I checked my returned data from the props.vesseltypes which is an array of as opposed to a flat array. So, the dropdown widget expects an array, what I return via the store is an array of objects. As such, this can't be used by the dropdown because it's not what it is expecting. My question is, how do I return this as a single array or flat array? How to get something from the state / store inside a redux-saga function?